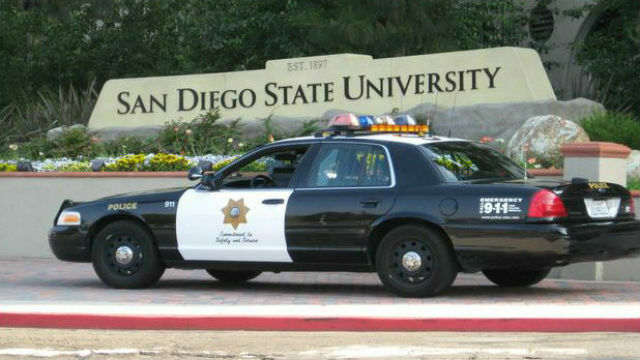 Madelyn Delarosa, 19, was taken into custody Saturday morning and faces three arson-related charges, according to a statement from San Diego State University campus police. Police say the spree began at 11 a.m. Thursday when an officer on patrol spotted and quickly extinguished a fire at a parked car at the 5500 block of Hardy Avenue. “Shortly after,” police were notified of another fire involving the exterior door of an apartment in the 5600 block of Hardy Avenue. A passerby put out that fire before officers arrived. Campus police and the San Diego Fire-Rescue Department’s arson team then identified Delarosa as a person of interest, officials said. At around 8:30 a.m. Friday, police received word of a fire involving an apartment near the 5500 block of Montezuma Road. That fire went out on its own. Shortly after 8 a.m. Saturday, a vehicle was set on fire near the 5500 block of Hardy Avenue. Police say they connected Delarosa to that crime and arrested her. On Saturday night, the fire re-ignited on its own and had to be extinguished. Investigators are working to identify a motive. An SDSU spokeswoman did not immediately know how recently Delarosa had been a student at the school.